If that was music, I have never understood what music was. 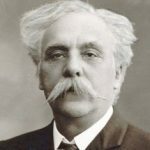 Gabriel Urbain Fauré was born in Pamiers, France. He was a French composer, organist, pianist and teacher. He was one of the foremost French composers of his generation, and his musical style influenced many 20th-century composers. Among his best-known works are his Pavane, Requiem, nocturnes for piano and the songs "Après un rêve" and "Clair de lune". After graduating from the college in 1865, he earned a modest living as an organist and teacher, leaving him little time for composition.